Free introduction to roller derby in Glasgow. Yes that's right, everyone in the world is doing roller derby these days. 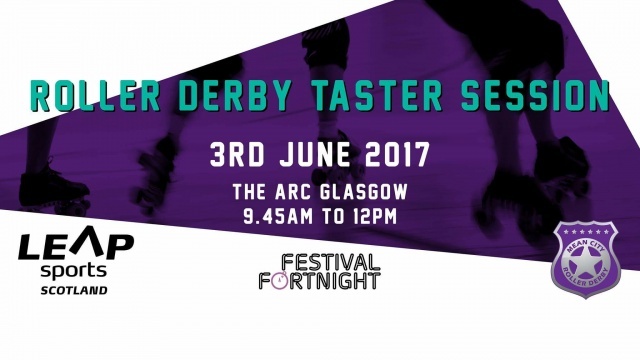 And you have a chance to join them with this FREE introduction to roller derby with Mean City Roller Derby, Glasgow, in conjunction with this year's Festival Fortnight. This is a fantastic opportunity for LGBTI community, friends and allies to come to an all gender roller derby experience, and you can sign up for it here. You’ll arrive 9.45am sharp at the ARC. We’ll get all the formalities out of the way and you can change into your derby kit. Skating starts at 10am, where you’ll learn some basic skate skills used in roller derby. This will be led by our fantastic Head of Training, Sylk, supported by her wonderful training team. At 11am, we’re going to show you how it’s done, so you get to watch a mini game of roller derby. Then, at 11.30am, once you’re hooked on the very moreish sport of roller derby, you can grab a cake and a cuppa and join our question and answer session. All equipment will be provided on the day, together with a mouth guard and water. If you already own a mouth guard, you may wish to bring it. Just wear comfortable breathable clothing and bring yourself, together with some pennies to buy a cuppa and some home-made cake. There will also be Mean City merchandise available with 10% of proceeds going to Leap Sports. This event is for over 18's only and booking via Facebook or by email at meancityrollerderby@googlemail.com is essential. Written on 28th April 2017.